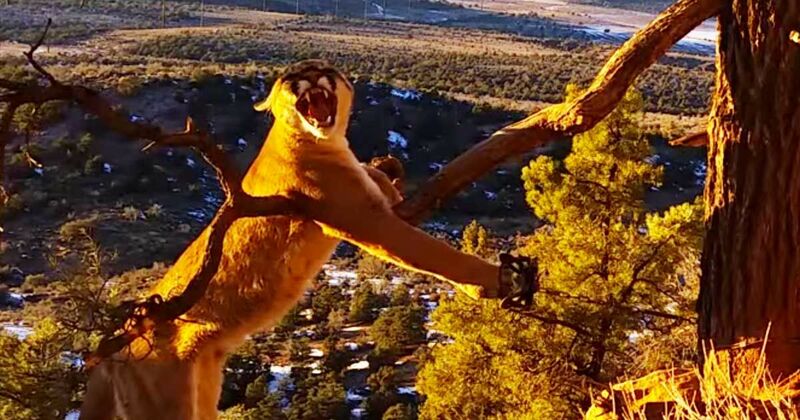 A video captures two Division of Wildlife Resources employees using their skills to help free an angry cougar that had become caught in a trap in Utah's Pine Valley Mountains in December 2015. The video depicts the terrifying moments the workers spend helping the animal get free. The workers believe the cougar had accidentally gotten caught in a trap meant for other animals, according to KSL. Mark Ekins, one of the officers in the video, tells KSL that the experience was scary. "If I wasn't nervous or started to lack respect for the power of that animal, it could potentially be very dangerous. I'm nervous and I'm extremely careful when doing it. ... I've probably only done three in my career that were as big as the one you saw," Ekins explains to KSL. An adult cougar, like the one seen in the video, can weigh between 90 and 200 pounds. There is a healthy cougar population in Utah, particularly in the High Uinta mountains, according to Wild Aware Utah. During the release, the workers slip a loop over the cougar's head to prevent him from attacking while they unhook his front leg. The cougar swipes, jumps and flails in an attempt to fight against the two men. One of the men even leaps over a rock to avoid the cat. During the rescue, Ekins is heard talking to the cougar, "I know, you're pissed. I'm pissed too. I don't want you in there any more than you want to be." With the cat restrained with catch poles, they cover his face so that they can remove the trap from his paw. After they remove the trap, both men step away and watch until the cougar realizes he isn't caught anymore and takes off into wilderness. Under Utah law it is illegal to intentionally trap a cougar. The trapping must be reported within 48 hours so that officials can remove the animal safely, according to KSL.